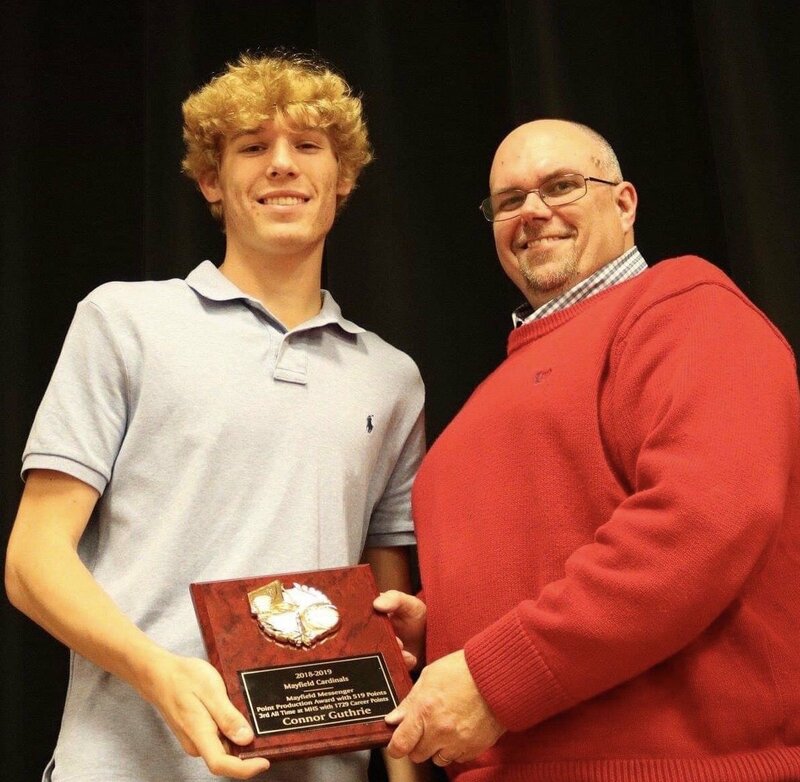 Mayfield senior Connor Guthrie (left) accepts the Mayfield Messenger Point Production Award from the newspaper's sports editor Eric Walker Sunday at the boys' basketball awards ceremony. Guthrie scored 519 points his senior season to lead the Cardinals. Several Mayfield cheerleaders were presented awards Sunday during the boys' basketball ceremony at Mayfield High School. They included (front, l-r) Kate Henderson, Julissa Ramirez, Michelle Turnbow, (back, l-r) Amari Kendrick and Aniya Fox. Not pictured is Jenny Xharicata. Mayfield concluded its successful 2018-19 boys’ basketball season Sunday with its awards ceremony at Mayfield High School. A large crowd on hand cerebrated the Cardinals’ Third District and First Region championships and said farewell to retiring head coach Chris Guhy. The ceremony featured video replays from the season, when Mayfield posted a 25-8 record, as well as two retirement videos for Guhy, who is retiring after 31 years of coaching basketball in the Mayfield system. Additional award presentations were also made to both players and cheerleaders. Senior Connor Guthrie was presented the Mayfield Messenger Point Production Award as the team’s leading scorer. Guthrie scored 519 points in this past season and 1,729 over his MHS career to become the program’s third all-time leading scorer. WYMC Mr. Dependable: DeSean Jones. Most Valuable Player awards went to the Guthrie brothers. Carson Guthrie finished his career with 1,632 points; 971 rebound for second all-time at Mayfield; 222 steals; and 359 assists. Connor finished with 577 career rebounds, 200 steals and 287 assists.